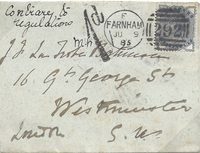 1885 ½d Slate-Blue, SG 187, tied to envelope from Farnham to Westminster "Contrary to Regulations" and showing A VERY FINE HANDSTRUCK 1d OF FARNHAM POSTAGE DUE. 1840 Entire from Kingston to London showing a very fine THAMES DITTON/PENNY POST. 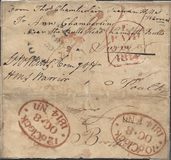 1854 1d Red-Brown, SG 17, Q-H, tied to envelope from Winchfield to Bentley via Farnham. At Farnham it was noticed that the stamp had been poorly cancelled therefore it was cancelled by a VERY FINE FARNHAM CIRCULAR DATESTAMP IN BLUE. - RARE. 1817 Entikre addressed to Sevenoaks, Kent and cancelled by a Farnham/41 mileage, SY 286. 1845 Envelope to Holborn showing on the front a very fine CRONDALL (under Farnham) undated circle. 1860 1d Rose-Red tied to cover addressed to Godalming by a fine Farnham 292 numeral showing on the front a very fine straight line CHURT in Undated Circle (under Farnham). Very Scarce. 1852 1d Pink envelope to Holborn showing on the reverse a very fine OTTERSHAW (under Chertsey) undated circle in Blue. 1843 1d Pink envelope addressed to Kingston, Surrey, showing on the front a very fine OXTED (under Reigate) undated circle. 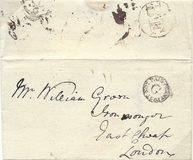 1833 Cover from Farnham addressed to London showing on the front a circular FARNHAM, mileage and arcs removed, SY 293. 1819 Bye Letter Entire to Mortlake showing a very fine WANDSWORTH Flat Top 'Ʒ' in red and Wandsworth country Sorting Office circular datestamp. Very Scarce. 1846 Cover from Cullompton to Farnham showing a fine "FARNHAM/DE 2/1846/3" SKELETON DATESTAMP. Scarce. 1848 Entire to Andover from Farnham showing on the front a very fine Crondall (Farnham) undated circle in black. 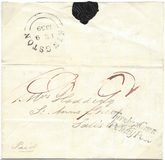 1859 1d Rose-Red, SG 40, tied to envelope to Highgate by a LONDON S.W. duplex showing a very fine PETERSHAM undated circle on the reverse. 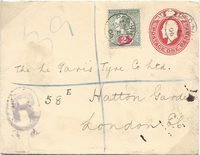 1906 Edward VII 1d Scarlet stationery envelope registered to London and franked by a 2d, SG 226 tied by RED.HILL circular datestamps. 1787 Entire from Stockwell, Surrey to London showing a superb General Office "PENNY POST NOT PAID/GH", L 390 and a large circular-framed B+E Receiver. 1839 London Cross Post, TURNHAM GREEN-KINGSTON, showing a superb Type 5 TURNHAM GREEN/PENNY POST. 1856 Envelope to Lingfield with, on the reverse, a fine LINGFIELD (under East Grinstead) undated circle. 1859 Entire to Bath with very fine TANDRIDGE (under Red Hill) undated circle. 1794 Entire to Hereford with, on the front, a very fine "RICHMD/-1 -" RECEIVER, L418. Scarce. 1858 Envelope to Lincolns Inn with, on the reverse, a very fine WIMBLEDON undated circle. 1857 Mourning envelope from Reigate to Lewis showing on the reverse both BETCHWORTH and LEIGH undated circles. 1848 1d Pink Stationery envelope to London with, on the reverse, a fine WOODHATCH (under Reigate) undated circle. 1908 2½d, SG 231 and 2d, SG 228, tied to plain Registered envelope to Germany by very fine CHIDDINGFOLD circular datestamps, the attached registered label being cancelled by a very fine CHIDDINGFOLD undated circle. 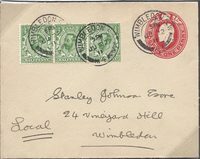 1910 MAY 9TH 7d GREY-BLACK, SG 249, tied to Edward VII 1d Scarlet Postal Stationery envelope to Kew Gardens by Richmond Surrey circular datestamps. SUPERB AND SCARCE ON COVER.